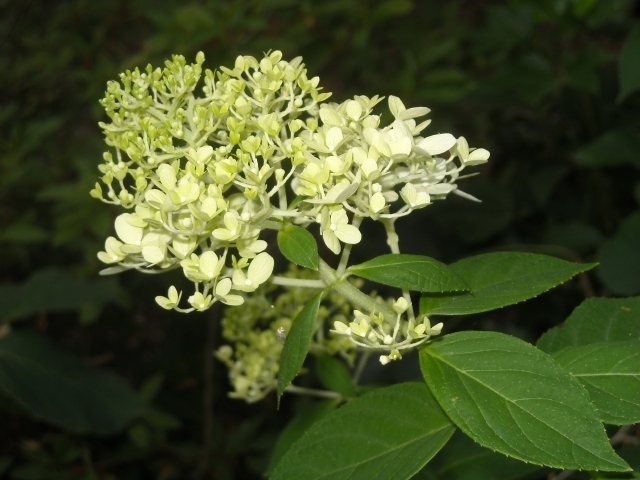 When the days grow short, one of the most spectacular plants on village greens across New England is PeeGee Hydrangea, formally, Hydrangea paniculata grandiflora. Fountains of large white cones of flowers spill from vase-shaped shrubs, ten feet tall. 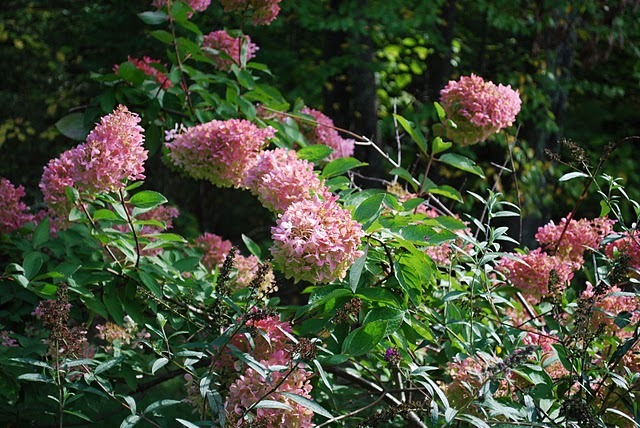 As they age, the blooms take on rosy pink earth tones. Some garden writers insist that this non-native from China and Japan is overplanted and over-sized, a monstrosity in today’s suburban gardens. Perhaps, but if they suddenly vanished, our fall family visits to New England would be the poorer. We look for them in every town, probably because we’ve never seen a knock-your-socks-off peegee close to home in the south. A ‘Pink Diamond’ we purchased years ago comes close. It’s a survivor in drought. 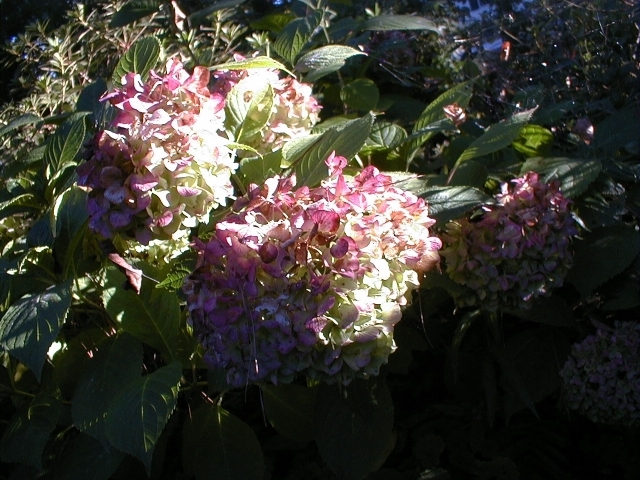 It needs less water and can take more sun than big leaf hydrangeas. It wilts only in very hot, dry weather. It’s one of those plants you cain’t hardly kill. Ours is planted in soil that can be wet in winter and dry in summer, definitely not the cushy moist but well drained soil that it would like. Over time we have added barrows and barrows of shredded garden wastes which compost in place, and the wet-dry extremes seem to be moderating. Our ‘Pink Diamond’ was a tyke when we planted it, barely a foot high in a four-inch pot, but it took off. So quickly, in fact, that some of its branches grew in scraggly. We had to take these off to give it some shape. Scary work on a little tyke, but the plant survived and grew. Now we do light annual shaping. We take out crossing branches and odd stragglers. We thin out old, heavy stems. If the plant seems out-of-bounds, we cut it down to a height we like. 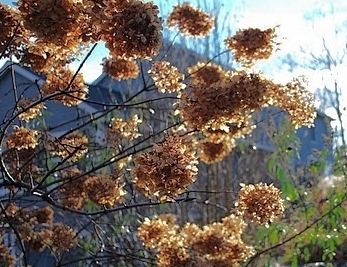 Panicle hydrangeas flower on new wood, so we do not lose blooms if we prune in late February or March. If we miss that deadline, we leave it alone. 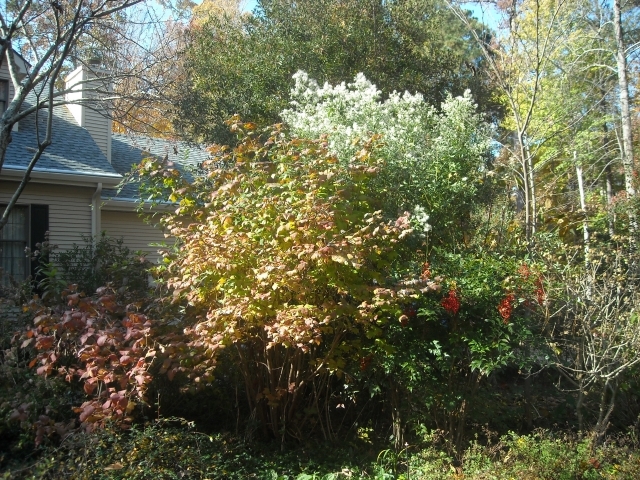 bodacious shrubs: hydrangeas, groundsel bush, viburnum, rose of sharon ‘Diane,’ . Oh, and did I mention a large wax myrtle we inherited with the property. 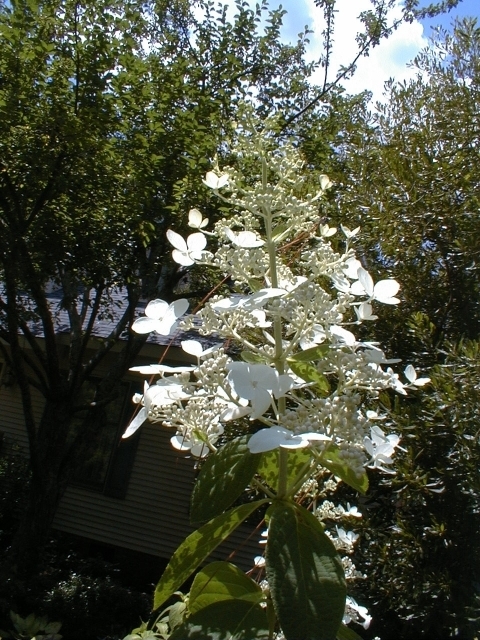 Competition notwithstanding, at almost ten feet it outshines its neighbors when panicles of creamy blossoms come into their own. With such splendor above, who would look down at a pile of dead leaves below? diamonds lose their sparkle, but we do not remove them until spring. The plant would look like a stack of sticks all winter. Maybe, just maybe, some insect might find a cozy haven from a cold winter rain under a petal-umbrella. Our ‘Pink Diamond’ is such a dependable show, we decided to add a ‘Limelight’ to our collection. It has had a checkered career in our garden. hope, until it became deer dessert. That is the penalty for buying small plants in small pots. assured us it was fine. Well, buyer beware. We sliced into its roots, repotted it in a larger pot with coarse potting soil (mostly ground pine bark) and will wait until fall to plant it. Now, I wonder if there is space for another plant in the garden. No matter, I will find some. So glad you are enjoying the blog. We are having a good time writing it. Thanks for your comments. best betting offers I must say, I enjoyed reading what you had to say, I couldnt help but be interested. It’s as though you had a fantastic grasp on the subject matter. stumble upon everyday. It’s always exciting to read articles from other writers and practice a little something from other web sites.